The idea came from a LAPD sergeant who grew up in Tokyo. There are over 6,000 kobans (also called “police boxes”) in Japan. 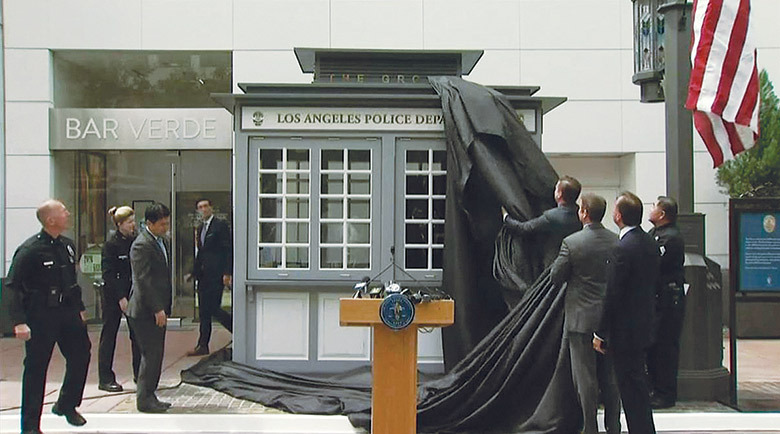 The LAPD opened its first koban in Little Tokyo, although it doesn’t fully function as a substation. The Wilshire Division is looking for Level I and II reserve officers to work the koban, mostly on weekends. The hours are from 1200 to 2200. It will be staffed by a minimum of two officers. For scheduling, contact Officer Segovia at (213) 473-0290 or Sergeant More at (213) 473-0558. The following is Department information on the detail. The purpose and function of the koban is to create a closer relationship between the community and local law enforcement. In determining the location for a koban, the Department sought a place that could accommodate the unique structure and allow officers to interact with a large volume of citizens of Los Angeles and visitors to our city. The Grove has been chosen as the ideal location to implement the first functioning LAPD koban. Obtain the key for the koban from the Wilshire Patrol Watch Commander. Upon arrival at the koban, ensure that the koban is stocked with enough IRs. Also, ensure that there is an adequate supply of information that can be handed out to the public for crime awareness and for spreading goodwill with the public (LAPD stickers, coloring pages for children). Open the front windows of the koban and interact with the public. At close, secure the interior storage locker and the access door to the koban. Return the key to the koban to the Wilshire Patrol Watch Commander. Expectations: Officers are to remain in or around the immediate vicinity of the koban during their shift. If there are issues regarding the heat and/or the air conditioner for the koban, notify the Watch Commander, who will reach out to the Grove. Anytime it is unsafe to remain inside the koban due to either inclement or heat-related conditions, officers can redeploy to stores near the koban for short-term relief while the conditions within the koban are remedied.